Primary neoplasms of bone are rare; accounting for 0.2% of overall human tumor burden. Osteosarcoma is the most common primary nonhematopoietic malignant tumor of bone in which the cancerous cells produce osteoid matrix. Osteosarcomas are classified as primary and secondary. These are intramedullary or central in the location in long bones and are usually of high grade. It presents in childhood and adolescents, with the median age between 10 and 14 years. Osteosarcoma is diagnosed most easily when it appears in its classic or conventional form. The production of osteoid directly by the tumor cells, named as tumor osteoid or malignant osteoid at least somewhere in the tumor, is the absolute requirement for the diagnosis of osteosarcoma. The genetic aberrations are complex with much variability. p53 analysis may be applied to the tumor tissue to prognosticate the individual cases. The absence of reproducible evidence of specific findings minimizes the use of immunohistochemistry (IHC) in osteosarcoma. We have attempted to study a series of osteosarcoma cases based on morphology and one case where IHC was applied to distinguish it from its close differential. Few cases of osteosarcoma with unusual presentation and rare histological types are documented here. A total of 21 diagnosed cases of osteosarcoma were analyzed from 2014 to 2016 in the Department of Pathology, SCB Medical College, Cuttack, Odisha. In our study, majority of cases were in the second decade (17/21) and diagnosed as conventional osteosarcoma (18/21) with the following microscopic features: “Spindled-to-polyhedral tumor cells, pleomorphic and hyperchromatic nuclei, easily demonstrable mitotic figures with atypical forms, the extracellular matrix mostly osseous, lined by tumor cells, and also various proportions of cartilaginous and fibrous elements [Figure 1].” Three cases with rare histological subtypes and unusual site of presentation are reported here. The demographic profile of the present study is highlighted in [Table 1]. A 16-year-old boy presented with a 2-month history of a huge mass of size (cm) just below the knee. Radiographic image showed an osteolytic and sclerotic lesion extending to the soft tissue at the metaphyseal region of the tibia. The mass was excised and sent for histopathological (HP) study. Microsections showed a population of small cells with hyperchromatic nuclei, inconspicuous nucleoli, scanty cytoplasm, and extensive areas of necrosis. One focus revealed tumor osteoid. 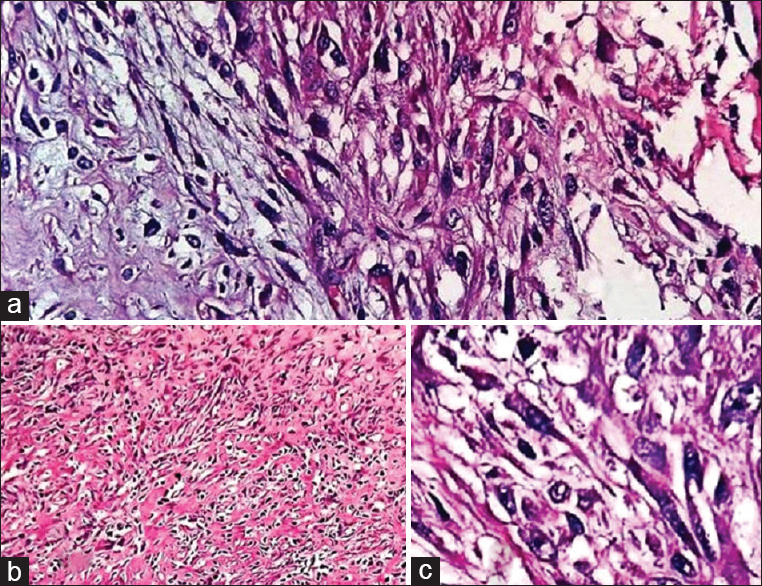 Though conventionally osteosarcoma shows large pleomorphic tumor cells, this case showed small cells to consider it as a histologic variant, i.e., small cell variant of osteosarcoma [Figure 2]. Unfortunately, the patient did not respond to the treatment and died of the disease. A 65-year-old female presented with a swelling in the lower jaw for 4 months extending intraorally as a firm mass with a smooth surface without ulceration. X-ray showed an osteolytic and sclerotic lesion of 4 cm in the posterior part of the ramus of the mandible. Wide margin resection was done. Gross examination showed that the consistency of the tumor in the mandible was grayish, cartilaginous, and firm. The tumor showed stellate-to-spindiloid tumor cells in singly and cords floating in the myxoid matrix. In other areas, chondrocytes in the lacuna revealed the moderate degree of cytologic atypia with multinucleated forms in a basophilic chondroid matrix. Tumor cells were arranged in lobules, the peripheral cells were more spindle shaped and cellular. Osseous differentiation seen at places with irregular bone trabeculae dispersed among atypical chondrocytic cells. An area revealed osteoid matrix directly formed by few neoplastic cells without the interposition of chondroid elements named as tumor osteoid to mark the tumor as osteosarcoma. Due to the heavy amount of chondroid elements throughout the tumor, it was categorized as a chondroblastic variant of osteosarcoma [Figure 3]. Since the tumor arose in the mandibular jaw bone, it was gnathic osteosarcoma. The patient was referred to a cancer institute, and currently she is undergoing chemotherapy treatment with an adequate therapeutic protocol. She has been responding to the treatment. A 22-year-old male was referred to the fine-needle aspiration outpatient department for aspiration of a large recurrent mass on the left upper arm, a huge bone mass eroding into the soft tissue, and a pathological fracture in the upper part of the humerus was noted. The smear revealed giant tumor cells and osteoclast-type giant cells (OCGCs) on an hemorrhagic background. A malignant bone lesion was suspected. Previous X-ray showed expansile eccentric lytic lesion at the upper end of the left humerus with a breach in the continuity of cortex at the dependent part and no soft-tissue extension. There was no zone of transition. Radiologic diagnosis was an aneurysmal bone cyst (ABC). Biopsy from the lesion done and microsection showed many OCGCs on an hemorrhagic background along with scattered stromal cells. A HP diagnosis of giant cell tumor (GCT) with the secondary ABC had been considered. He underwent surgical treatment of intralesional thorough curettage with bone grafts. After 3 months of surgery, the patient had a local recurrence of the tumor at the same site. The swelling was firm to hard in consistency. The recurrent tumor radiography showed significant bone destruction. The recurrent tumor in excisional biopsy grossly showed a hemorrhagic mass, and the microscopy revealed frank malignant transformation characterized by highly pleomorphic spindloid cells having hyperchromatic irregularly shaped nuclei with mitotic activity (including atypical forms) present on the septa of dilated blood-filled spaces. No focus of unequivocal tumor osteoid was seen. A significant number of OCGCs were seen within the tumor. Large areas of fibrinoid necrosis were evident. On IHC study, OCGCs were strongly positive for CD68 and negative for CD163. Stromal components were focally positive for p53 protein while totally negative for CD163. A diagnosis of “giant cell-rich osteosarcoma with aneurysmal cyst pattern” was made [Figure 4]. The patient was treated with bisphosphonate and denosumab chemotherapy with limb salvage. The patient succumbed due to metastasis while on chemotherapy in the cancer center. Osteosarcoma accounts for 15%–35% of all primary bone tumors, and in jaw bones, it is even rarer representing 4%–8% of all osteosarcomas, and it is 4.76% in the present study., Common sites of involvement of osteosarcoma are the metaphyseal regions (91%) of long bones of the extremities with their occurrence in the distal femur, proximal tibia, proximal humerus, and proximal femur in descending order. 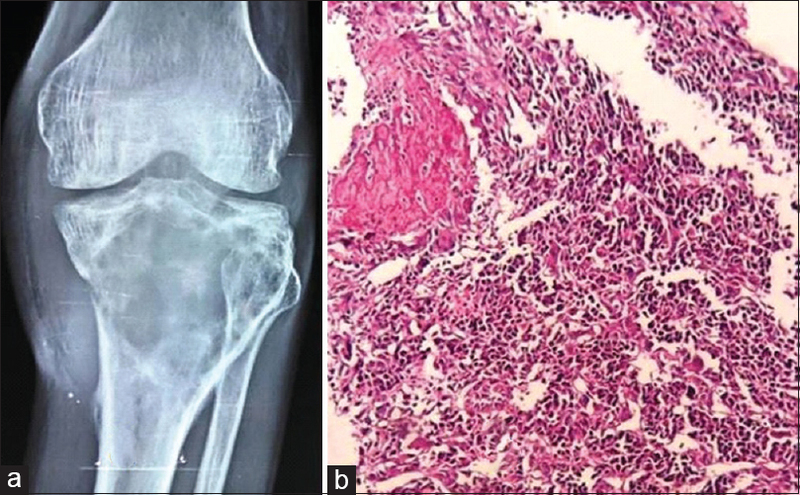 Almost 50% of osteosarcomas present as swelling around the knee. Involvement of nonlong bones such as jaw (gnathic), pelvis, scapula, spine, and skull increases with age. Primary osteosarcomas are common and known as conventional types. Rarely, other histological forms of primary osteosarcoma are seen, namely, telangiectatic, small cell, osteoblastic-sclerosing type, clear cell type, chondroblastoma-like osteosarcoma, giant cell-rich variant, malignant fibrous histocytoma-like osteosarcoma, osteoblastoma-like osteosarcoma, epithelioid type, and surface osteosarcoma. Osteosarcoma is called secondary when the bone is altered by previous irradiation or co-existing Paget disease, and the age of presentation is older. The small-sized tumor cells in small cell variant osteosarcoma closely mimic Ewing's sarcoma. The presence of tumor osteoid plays an important role in arriving at a diagnosis of small cell histologic type of osteosarcoma. This type of osteosarcoma itself has a slightly worse prognosis. The small cell variant in our study showed poor response to treatment and died within 18 months of diagnosis. According to the WHO classification, the chondroblastic osteosarcoma is defined as a histological entity characterized by the predominant presence of chondroid matrix, which tends to exhibit a high degree of hyaline cartilage and is intimately associated with the nonchondroid element (osteoid or bone matrix), satisfying the presenting case biopsy findings. Studies suggest that chondroblastic osteosarcomas arising from jaw bones are usually myxoid which we observed in one of the cases. The pattern of chondroblastic osteosarcoma represents 25% of all reported cases of osteosarcoma. Cytologic atypia is commonly seen in chondroblastic variant, and atypia is very much evident in chondroblastic osteosarcoma case of the present study. Chondrosarcoma is a possible differential diagnosis for the chondroblastic variant of osteosarcoma, making diagnostic difficulty. Chondrosarcoma is extremely rare in the jaw bone and has the worst prognosis. Osteoid formation within the tumor is the most important histomorphologic diagnostic feature. We managed to figure out the tumor osteoid in one tissue slide out of multiple sections to arrive at a diagnosis of the chondroblastic variant of osteosarcoma in our case. Ten percent of osteosarcoma occurs in the head and neck, and the mandible is the most commonly involved site. We found a mandibular location though it is rare. Mandibular osteosarcomas present at a later age and mandibular lesions were predominant in female patients in one study as in our present chondroblastic osteosarcoma case. The present chondroblastic osteosarcoma case is 65 years of age, and this is the age of presentation of secondary types of osteosarcoma with a history of other bony lesions. After a thorough investigation, we did not find any other bony lesions confirming it as a primary type. The most common histologic subtype was chondroblastic with an age range of 12–79 years. Prognosis of chondroblastic osteosarcoma is viewed by many authors. Broder's grading of the tumor based on the degree of cellular anaplasia including cellular pleomorphism, hyperchromatic nuclei, bizarre mitosis, and multinucleated giant cells is prognostically significant. Overall, the 5-year survival rate for mandibular osteosarcoma is 41% without chemotherapy., Factors associated with a poor prognosis of oral osteosarcomas are age older than 60 years, nonmandibular location, and tumor size >6 cm. Only one adverse factor exists in the present such type of case, i.e., advanced age. Osteosarcoma of the craniofacial bones usually behaves less aggressively than appendicular skeleton osteosarcoma. Our case's age was more than 60 years and the cellular atypia was of intermediate grade. Hence, the patient is kept under a close follow-up after a free surgical margin resection and adjuvant chemotherapy. Gnathic osteosarcoma, irrespective of the elderly age of presentation as in our case, carries a better prognosis than primary appendicular extragnathic osteosarcoma. However, appendicular osteosarcoma presenting at an elderly age group (secondary osteosarcoma) carries the worst prognosis. Although tumor osteoid is hardly discernible, the diagnosis of osteosarcoma was established by noticeable p53 positivity and characteristic CD163 negativity in the stromal cells. In giant cell-rich type histomorphology with plenty of OCGCs in more or less uniform dispersion, malignancy in GCT remains as the closest differential. The macrophage lineage marker CD163 would have shown positivity in aggressive stromal cells because these cells are the neoplastic components in case of malignancy in GCT. Chow et al. have documented a similar case as ours. They have set defining criteria for giant cell-rich osteosarcoma. These types of tumors with paucity of tumor osteoid still are said as osteosarcoma in which more than 50% of the tumor consists of numerous uniformly distributed OCGCs amidst oval or spindle mononuclear cells embedded in a fibrovascular stroma. Moreover, aneurysmal cystic pattern is commonly encountered in this setting. Malignant GCT resembles features in fact representing some primary bone tumors such as giant cell-rich osteosarcoma. The features compatible with giant cell-rich osteosarcoma are age around 15–20 years, metaphysis involvement, more or less uniformly distributed giant cells, scanty malignant osteoid materials, atypical spindloid cells, abundant and atypical mitotic activity, necrosis, local recurrence <5%, metastasis of 35%, and resection and chemotherapy as the treatment option. The features compatible with malignancy in GCT are age around 35–45 years, epiphysis–metaphysis involvement, uniformly disposed giant cells, absence of malignant osteoid materials, atypical oval cells, scant-to-abundant mitotic activity, necrosis, local recurrence of 25%, metastasis of < 5%, and curettage and bone grafts as the treatment module. The bottom line remains to be vigilant in differentiating the giant cell-rich osteosarcoma from malignant GCT. In doing so, malignant osteoid production may all add up to point the finger in the right direction. Thus, malignancy or aggressive GCT is excluded in the present such type of case. Multinucleated giant cells also tend to be more numerous in telangiectatic osteosarcomas than in other types of osteosarcomas, but they are not distributed uniformly in any of the solid areas of tumor tissue. In addition, a great deal of nuclear pleomorphism is commonly evident in telangiectatic osteosarcomas. This documented tumor did not show that high degree of pleomorphism. Thus, telangiectatic osteosarcoma was excluded, and the blood-filled spaces with fibrous wall lining were categorized as the “aneurysmal cyst areas.” In 2002, the working group used both telangiectatic osteosarcoma as well as ABC-like osteosarcoma as synonymous tumors. However, the subsequent edition in 2013, “the aneurysmal-cyst-like osteosarcoma” term was excluded from telangiectatic variant., Due to CD68 positivity in bland OCGCs and pleomorphic stromal cells, a diagnosis of giant cell malignant fibrous histiocytoma is considered but excluded due to the young age of our case and absence of spindle cell storiform pattern. The authors have also pointed out that it is important to rule out giant cell-rich sarcoma in secondary aneurysmal cyst category of tumors. Roentgenogram showed a purely lytic destructive lesion of aneurysmal cystic-type osteosarcoma which simulated ABC in the initial radiograph diagnosis. The documentation of osteoclastic giant cell-rich osteosarcoma is a rare subtype of osteosarcoma and first described by Bathurst. We finally arrived at the diagnosis of “giant cell-rich osteosarcoma with aneurysmal cystic pattern,” fulfilling all the criteria both morphologically and with IHC markers in our setup. The initial needle biopsy did not predict the extent of local aggression. We possibly did not find the pleomorphic stromal cells in the pool of bloody background, may be due to the needle entered into the blood space. The prognosis of malignancy in GCTs is similar to that of a high-grade spindle cell sarcoma. Survival of patients drop down from 70% to 20% in those patients return with recurrence or metastasis. Though prognosis is almost similar in both malignancies in recurrent GCT and giant cell-rich osteosarcoma, we worked up the case to arrive at an accurate diagnosis because these closely mimicking tumors have completely different histogenesis. During the past 2 years in our referral hospital, we have given a diagnosis of osteosarcoma in 21 cases. Out of them, 18 cases were conventional osteosarcoma subtypes. Since three unusual variants of osteosarcoma were encountered, we put forth the cases, namely, (a) small cell variant of osteosarcoma; (b) gnathic osteosarcoma, chondroblastic variant; and (c) “giant cell-rich osteosarcoma with aneurysmal cystic pattern,” distinguishing it from its closely overlapping features of malignancy in GCT with review of literatures. Divyesh PW, Akansha NC, Sangeeta RP, Nidhi ST. Osteosarcoma of mandible: Report of two cases with review of literature. Oral Maxillofac Pathol J 2015;6:625-7. Fletcher CD, Bridge JA, Hogendoorn PW, Mertens F, editors. Osteogenic tumors. World Health Organization, Classification of Tumours: Pathology and Genetics of Tumors of Soft Tissue and Bone. Lyon: IARC Press; 2013. p. 281-95. Kumar V, Abbas AK, Aster JC. Robbins and Cotran pathologic basis of disease. 9th ed. Philadelphia, PA: Elsevier/Saunders. 2015. p. 1179-226. Borba MA, Farias TP, Sa RM, Dias FL, Freitas EQ, Lima RA, et al. 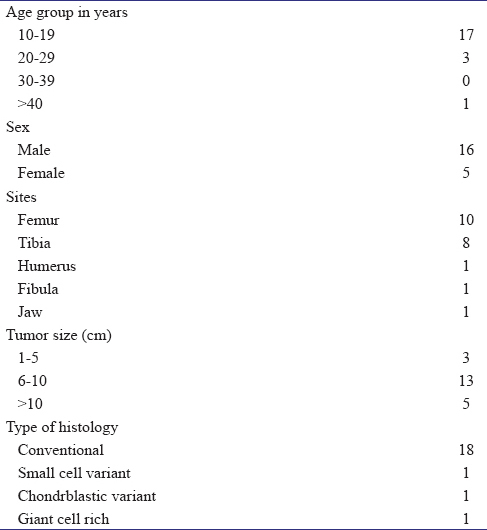 Osteosarcoma of jaw: Prognostic factors. Rev Bras Cir Cabeca Pescoco 2004;33:15-9. Klein MJ, Siegal GP. Osteosarcoma: Anatomic and histologic variants. Am J Clin Pathol 2006;125:555-81. Almeida E, Mascarenhas BA, Cerqueira A, Medrado AR. Chondroblastic osteosarcoma. J Oral Maxillofac Pathol 2014;18:464-8. Soares RC, Soares AF, Souza LB, Santos AL, Pinto LP. 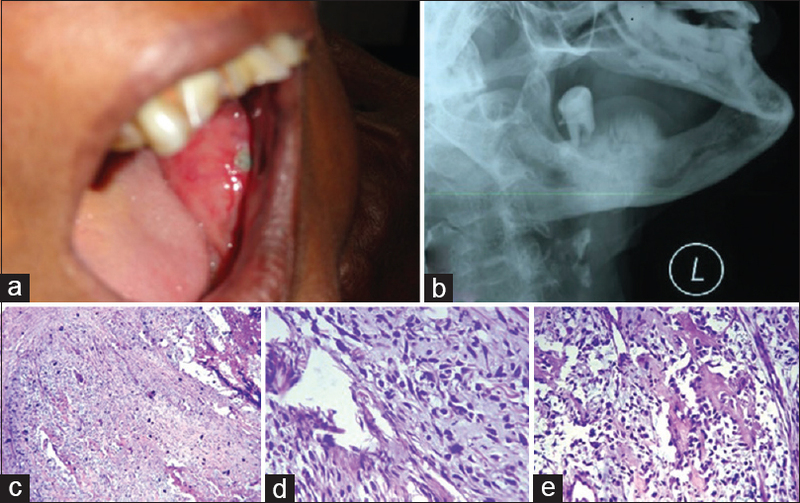 Osteosarcoma of mandible initially resembling lesion of dental periapex: A case report. Braz J Otorhinolaryngol 2005;71:242-5. Ogunlewe MO, Ajayi OF, Adeyemo WL, Ladeinde AL, James O. Osteogenic sarcoma of the jaw bones: A single institution experience over a 21-year period. Oral Surg Oral Med Oral Pathol Oral Radiol Endod 2006;101:76-81. Wankhedkar D, Chaphekar A, Patankar S, Tripathi N. Osteosarcoma of mandible: Report of two cases with review of literature. OMPJ 2015;2:625-7. Ribeiro AL, Nobre RM, Alves JS, Souza PA, Silva JN, Pinheiro JJ. The importance of early diagnosis and an accurate tumoral evolution in the treatment of mandibular osteosarcoma. Rev Odonto Cienc 2010;25:319-24. Jack LC, Krishnan KU, David DD, Kenneth DD. Osteosarcoma of the jaw. Cancer 1983;51:2311-6. Mardinger O, Givol N, Talmi YP, Taicher S. Osteosarcoma of the jaw. The Chaim Sheba Medical Center experience. Oral Surg Oral Med Oral Pathol Oral Radiol Endod 2001;91:445-51. Alberto DB, Walter M, Francesco C, Michele M. Aggressive chondroblastic osteosarcoma of the jawbone. Oral Oncol Extra 2005;41:296-8. Keiji S, Shigeki Y, Hisashi I, Hideshi S, Nobuo N, Tetsuro N. Giant cell-rich osteosarcoma: A case report. Nagoya J Med Sci 1996;59:151-7. Chow LT. Giant cell rich osteosarcoma revisited-diagnostic criteria and histopathologic patterns, Ki67, CDK4, and MDM2 expression, changes in response to bisphosphonate and denosumab treatment. Virchows Arch 2016;468:741-55. Haque AU, Moatasim A. Giant cell tumor of bone: A neoplasm or a reactive condition? Int J Clin Exp Pathol 2008;1:489-501. 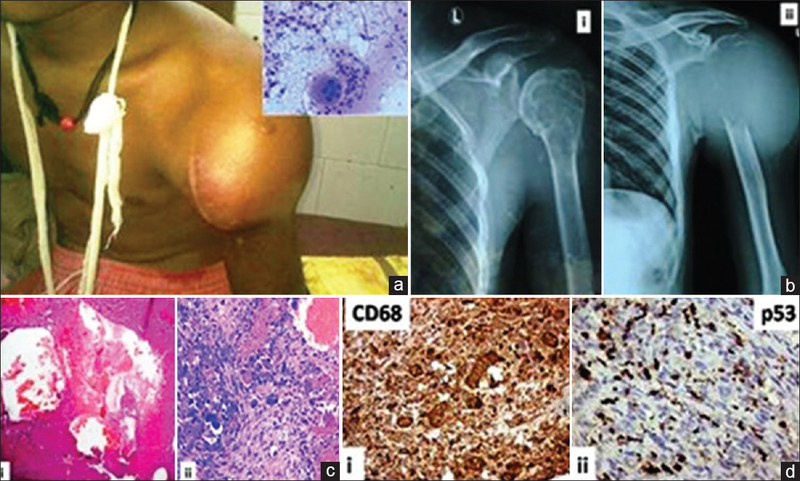 Ambereen AI, Muhammad EK, Sarosh MS, Munazzah H. Giant cell-rich osteosarcoma: Unravelling an elusive, enigmatic entity. Int J Pathol 2012;10:36-8. Fletcher CD, Unni KK, Mertens F, editors. Pathology and genetics of tumours of soft tissue and bone. Osteogenic Tumours. Ch. 11. Lyon: IARC Press; 2002. p. 267-71. Mentzel T, Fletcher CD. Malignant mesenchymomas of soft tissue associated with numerous osteoclast-like giant cells mimicking the so-called giant cell variant of “malignant fibrous histiocytoma”. Virchows Arch 1994;424:539-45. Anchan C. Giant cell tumor of bone with secondary aneurysmal bone cyst. Int J Shoulder Surg 2008;2:68. Bathurst N, Sanerkin N, Watt I. Osteoclast-rich osteosarcoma. Br J Radiol 1986;59:667-73.